A major English-language newspaper in Japan said it would no longer use the term “forced labor” when reporting on Koreans who worked in Japan before and during World War II, despite the fact that many of the workers were there against their will. 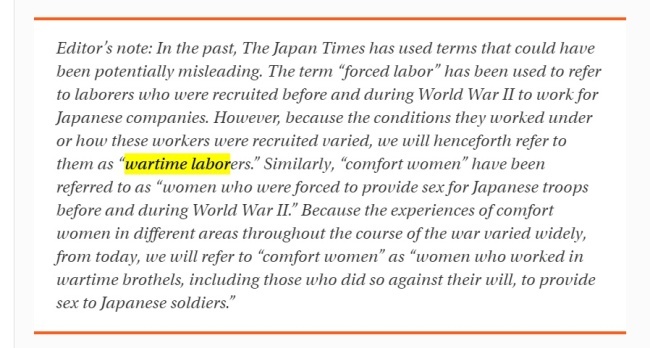 In an editor’s note on the paper’s website Thursday, the Japan Times said people previously described as victims of “forced labor” would now be called “wartime laborers” instead. “Because the conditions they worked under or how these workers were recruited varied, we will henceforth refer to them as ‘wartime laborers,’” the statement read. 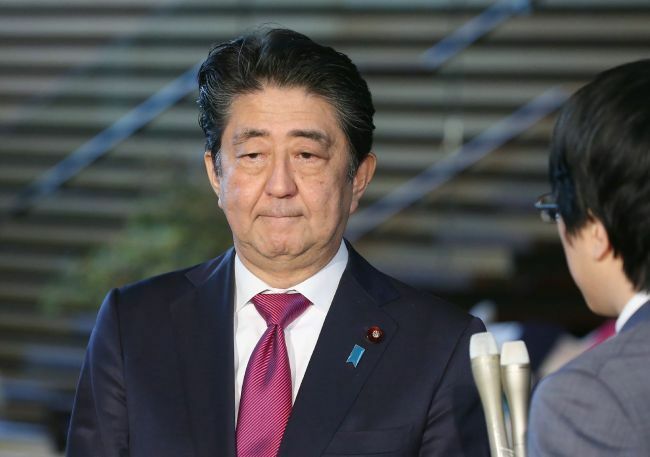 The change of editorial policy comes just weeks after Japanese Prime Minister Shinzo Abe bucked tradition and used the term “former civilian workers from the Korean Peninsula” while addressing the parliament, referring to Koreans widely considered to have been forced laborers. His remarks came in the wake of a decision by South Korea’s top court to uphold a 2013 lower court ruling against Nippon Steel & Sumitomo Metal Corp., ordering the company to compensate four Korean plaintiffs. This past Thursday, Korea’s Supreme Court again sided with forced laborers when it ordered Mitsubishi Heavy Industries Ltd. to compensate 11 plaintiffs in separate cases. Abe’s choice of words, “former civilian workers from the Korean Peninsula,” was seen as an attempt to downplay the country’s colonial past in Korea and to deny the forced nature of the work. The controversy over the Japanese government’s decision to refrain from using the accurate term “forced labor” is the latest in a series of clashes between the two countries. When Hashima Island in Japan was given UNESCO World Heritage status in 2015, there was controversy over the lack of any mention of the Koreans who were forced to work on the island during the war, prompting Japan to promise full transparency about the island’s history. In a meeting this year, UNESCO’s World Heritage Committee asked Japan to keep that pledge.